Please do not drink the Flavor Aid and let anyone tell you last night’s game—at 6-6, the lowest-scoring tie since the NFL introduced overtime in 1974—was “good” or “watchable” or “a better use of your time than going to sleep early and starting the week rested.” Special-teams incompetence, an Arizona offense that couldn’t do anything against a gassed Seahawks defense (which was on the field for a comical 46:21 because Seattle’s offense was even worse), and punts, punts, punts! (Fifteen punts! More punts than points! )—That was not enjoyable football. Had that not been Cardinals-Seahawks—had it been, say, Jaguars-Titans in a Thursday game—there’d be congressional inquiries on what’s wrong with the NFL. Oh look! Jaguars-Titans is this week’s Thursday game. The NFL hates you. And because I hate you just as much, let’s revisit last night’s stinkbomb through everybody’s favorite lens: that of rulebook minutiae! Let’s go back, way back to early in the second quarter, before you started longing for death, before you realized you were already dead and in hell, to Seattle’s blocked field goal. It looked like a beauty of a block: Seahawks LB Bobby Wagner got a head of steam and leapt up and over long snapper Aaron Brewer to get a hand on the Chandler Catanzaro kick. A penalty flag was thrown on the play, then picked up by the officials. 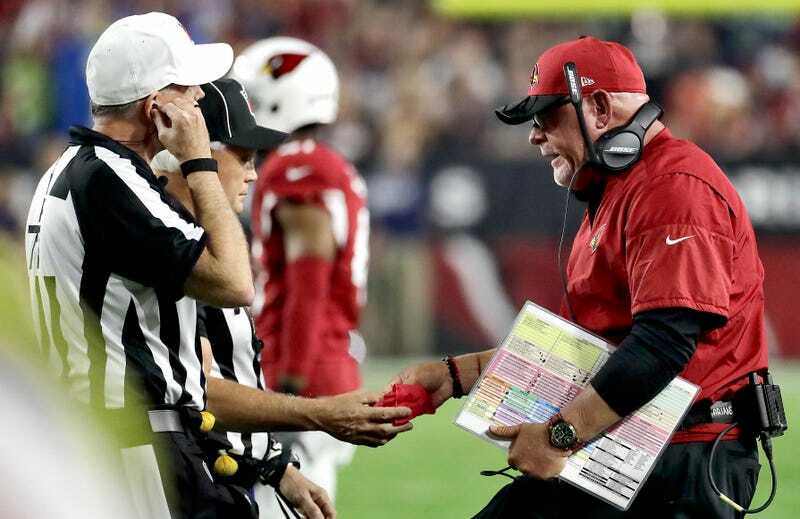 Cardinals coach Bruce Arians then threw his challenge flag, but the thing he wanted to review (we’ll get to that) was not reviewable, so Arizona was charged a timeout, one they really could have used at the end of the half. (1) A Team B player, who is within one yard of the line of scrimmage, must have his entire body outside the snapper’s shoulder pads at the snap. The officials correctly ruled that Wagner wasn’t within a yard of the line of scrimmage, so no foul. (s) Running forward and leaping in an obvious attempt to block a field goal or Try Kick and landing on players, unless the leaping player was originally lined up on the line of scrimmage when the ball was snapped. “Landing” is not “touching.” But where’s the line between the two? That’s a judgment call. And like all judgment calls, it is not subject to review. Arians learned that the hard way. He threw his challenge flag, believing the officials had missed the contact, and ended up forfeiting a timeout on a play that wasn’t legally reviewable. “He touched him,” Arians said. “You saw it. Did you see it? Didn’t he touch him? Yeah, he sure did. It sure looked like it to me, but it was not ruled that way, same with the last one. He definitely touched him.